The halfway point for the minor leagues has passed but we are close enough that we can hand out some mid-season hardware. Here are the Best Pitcher and Hitter from each level of the Milwaukee Brewers farm system in the season's first half, career minor leaguers excluded. We'll also take a look at players who have seen their stock rise the most in that same amount of time. Best Hitter - Mike Walker - 3B - Walker is a no-brainer here, through Wednesday he led the team with 12 home runs, 13 doubles and 52 RBIs. He's hitting a nice .282 with OBP over .400. 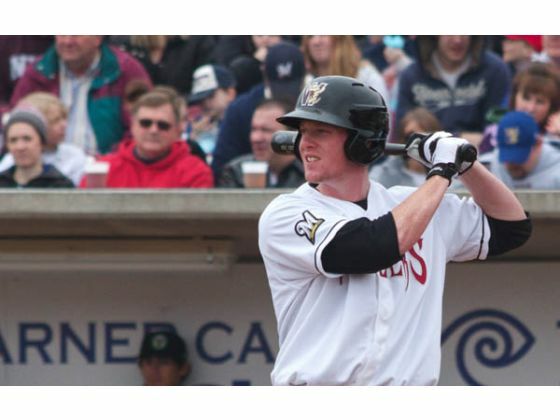 The numbers stack up with most of the Midwest League's top hitters as well. His OPS is 7th in the league and his walks are second to only one player, teammate Nick Shaw. Best Pitcher - Tyler Thornburg - SP - Another no-contest competition, Thornburg was that dominant in the first half of the season. I say was, because Thornburg has been promoted to Brevard County, the Brewers High-A affiliate. Thornburg had the lowest ERA in the entire Midwest League, a sparkling 1.57 with an equally dominant 1.08 WHIP. Rising Star - T.J. Mittlestaedt - OF - A 44th round pick in the 2010 draft, Mittlestaedt has had a fine 2010 season. Barely a blip on the prospect radar, he's definitely opened some eyes with a strong first half. Going into Wednesday night's game he had a .310 with a .436 OBP and seven home runs. He's feasted against right-handed pitching, to the tune of .355 average and .471 OBP. It just goes to show that there is talent to be found in every round of the draft. Best Hitter - Khristopher Davis - OF - Deja Vu? Davis had a terrific 2010 campaign with Wisconsin a year ago, hitting .280 with 22 home runs and he's showing that to be no fluke in 2011. Through the season's first half, Davis has 10 home runs to go with 18 doubles. He's also hitting .322, tied for fourth in the Florida State League to go with a .416 OBP, third in the FSL. Best Pitcher - Nic Bucci - SP - This was a tough call, by the end of the season this award will likely belong to Kyle Heckathorn, especially with the way he's pitched since a missed start in early June, but until then, the spot is Bucci's. A definite work in progress, Bucci was drafted in the 18th round in 2008. He's been improving steadily from year to year and seems to be figuring it out in 2011. 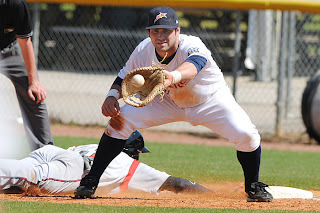 Rising Star - Santo Manzanillo - RP - Signed as an undrafted free agent out of the Dominican Republic in 2005, Manzanillo missed the 2009 season with Tommy John sugery. 2010 was a wash, with a 5.77 ERA over 53 innings at Wisconsin, but the organization saw fit to promote him anyways. That confidence has been rewarded. Manzanillo sports a 1.59 ERA and has converted 10 save chances. He's striking batters out at a pace of nearly one per inning and has a very nice WHIP of 1.13. Time will tell for the 23-year-old right-handed pitcher, but this is a step in the right direction. Best Hitter - Sean Halton - 1B - Halton gets a slight nod over last year's minor league hitter of the year Erik Komatsu on the strength of extra-base hits. Halton leads Huntsville with five home runs and 21 doubles all the while batting a very nice .313. His plate presence needs to be better (only 11 walks so far this year) but he's been an effective first baseman for the Stars thus far. Best Pitcher - Cody Scarpetta - SP - Almost but not quite has been the story for the Brewers top two pitching prospects at Huntsville this year (Scarpetta and fellow righty Wily Peralta). Still, Scarpetta has been a bit more consistent and earns the title here. After a terrible month of April (7.07 ERA) he bounced back with a couple of solid months on the mound. Rising Star - Steffan Wilson - 3B - Wilson fell completely off the map after an injury plagued 2010 season that saw him hit .201 and play in only 60 games. At the Double-A level that can be a very, very bad sign. But he's recovered nicely this year to a .266 average with 14 doubles and 37 runs driven in. If he can stay healthy his versatility could be the key to his major league future - he's seen time a number of different position in his time in the minors, including first base, third base, left field and right field. Best Hitter - Mat Gamel - 1B - No question here, Gamel was white-hot prior to his call-up this week. Where to begin, Gamel lead the Sounds in home runs (18), RBIs (58), Doubles (21), runs scored (54) and total bases (169). Basically every offensive stat of any consequence. Best Pitcher - Amaury Rivas - SP - Almost by default does Rivas get this nod. The only other options would be fellow starter Frankie De La Cruz, who is in his fourth season at the Triple-A level, and Sam Narron, who is also in his fourth Triple-A season. Rivas hasn't been bad, but he hasn't been as good as you would hope for from a top prospect either. Rising Star - Eric Farris - 2B/SS - So, this one is kind of a reach. I'll admit that straight away. Farris was the top second base prospect in an organization that wasn't going to have an opening at second base anytime soon. In recent weeks, Farris has seen increased playing time at shortstop - a position at which Milwaukee has no semblance of a decent prospect. Whether the experiment is temporary or long term, if Farris can make that transition his value to the organization becomes immensely higher. His numbers this year are solid but not exceptional. He has a .267 batting average along with 13 doubles, three triples and four home runs. He's not an offensive juggernaut but he has the chance to be at least an acceptable major league hitter. He's one to keep an eye at the least. The stage is set. A close game, the 8th inning, the ninth is spoken for but the setup role is up for grabs. The lead is close enough for a save situation, so strategy demands a strong relief option. Who do you choose? The Case - Fresh off his sixth loss of the season, a team high, Loe has pitched in three straight games. He's been, arguably, overworked in the early part of this season but is coming off a very strong 2010 campaign in which he had a 2.78 ERA over 58.1 innings pitched. At times he's seemed equal parts dominant and disastrous. The Verdict - Having pitched three consecutive days with the third resulting in a loss in a 1-0 game, Loe is off limits. Confidence in the lanky right-hander must be waning. The Case - Playing the role of a long relief pitcher, Mitre has performed well. He's pitched 27 innings but hasn't seen game action since June 9 against the Mets. Mitre's strikeout to walk numbers are far from dominant (10:7) but he's been effective, sporting a 2.00 ERA. What's more, his 1.11 WHIP is third best on the staff. Mitre also has a good track record in relief as well, to the tune of a 3.33 ERA in 2010 while pitching 54 innings for the New York Yankees. The Verdict - Mitre's been good, but his numbers lend themselves more to a good middle-reliever than a setup man. Mitre sits. The Case - Another middle-to-long releiver, Estrada has been up and down thus far in 2011. He's been mostly good pitching out of the bullpen, with a 3.86 ERA in 16.1 relief opportunities. Estrada hasn't pitched in a game since June 9 either, and in two of his last three outings has given up runs. Also disagreeable is Estrada's career numbers, prior to 2011 he pitched only 31.1 innings at the major league level with a low season ERA of 6.14. The Verdict - Estrada's transition to relief pitcher has been good so far, but is still in the early stages. In a pressure situation he should only be gone to as a last resort, his body of work should preclude him from meaningful innings. The Case - One of the best young arms in the Brewer organization, Braddock has seen his use somewhat limited since a stint on the disabled list. Even so, since returning to the active roster Braddock has yet to give up a run. As a lefty, there could be some concern about matching him up with a right-handed hitter. His numbers are across the board good, a 2.19 ERA in 17 appearances, he's walked six and struck out 13. The Verdict - A good choice, though maybe not the best one. Braddock is being carefully managed this year to avoid injury and overuse. He has the stuff to be a dominant 8th inning pitcher but may not be quite there yet. Still, Braddock may be the best option so far. The Case - Since blowing a pair of early saves, Axford has been dominant. He's converted his last 18 and struck out 40 batters in 30.1 innings. He has an ERA 2.97 and hasn't given up a run since May 21. Axford also hasn't pitched a save of more than an inning yet in 2011, after doing in multiple times in 2010. He's also pitched in nearly half the Brewer's games this season. The Verdict - Concern over wearing Axford out seems mixed. He hasn't pitched a multi-inning save but he's pitched in a high number of games. 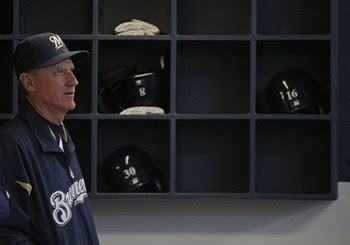 The plan seems clear though - the ninth inning is Axford's and the eigth belongs to someone else. The Case - After a forgettable 2010 that resulted in a mostly lost season and shoulder injury, Hawkins started the year on the disabled list. He joined the team in late April and has been very good since his return. In his 17 appearance he's given up only one earned run, in his first outing of the year. Hawkins strikeout numbers haven't been great (8 in 16.1 innings) but he seems to be returning to the form Milwaukee was hoping for when they signed him. The Verdict - With a career's worth of experience, Hawkins should be the choice. He's pitched well this year and is well rested, he hasn't seen a game in nearly a week. But more to point, Hawkins has been a successful reliever for the last decade of his career. The Truth - Manager Ron Roenicke's decision to put Marco Estrada in for the eighth inning of Tuesday night's game against is befuddling at best and asinine at worst. His unflinching confidence in Kameron Loe is difficult enough to comprehend at time but there is a difference: Loe has done something to earn his role. Estrada's big league accomplishments are so minimal that using him in positions like Tuesday night's are a flat out mistake.